I recently came across the Cuttlebug Challenges blog and I wanted to participate this week with Be Inspired #44 - create a scene card. I also combined it with the Card Positioning Systems sketch 128 as well as the Caardvarks winter card challenge. Thanks for stopping by and I hope you have a wonderful weekend!! Oh wow! LOVING the embossed pieces, I just love embossed stuff and what a cute theme. Great use of that CPS sketch. 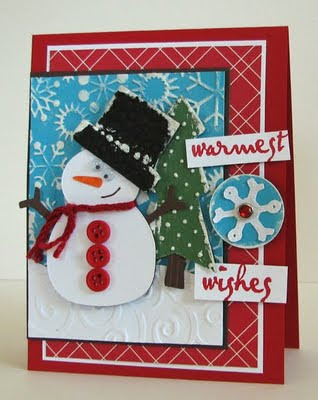 This card is gorgeous, love the snowman! And the colors are fab! Wondeful card Amy! Great card, Amy! Fantastic use of embossing! So glad you joined us in this week's Be Inspired! 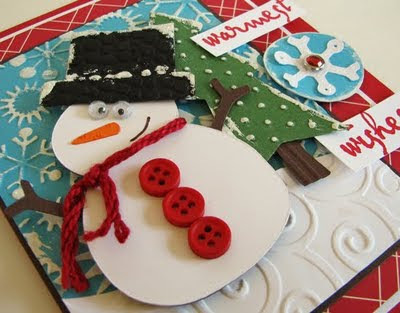 That googlie eyed snowman just cracks me up ... so very fun ... love everything about this design ... thanks for joining us at Caardvarks. ooh! a holiday card, in the summer, hehe. I really like the snowman and the background, very good job! oh my gosh! how totally ♥FAB♥!!! i love everything about this, especially that ADORABLE snowman!!! h any! this is absolutely adorable and wonderful! youve doen a super job creating this fantatsic card! TFS! and Thanks for playing along this week at the cuttlebug challenge blog! Super great card. I love the way you popped the snowman. The background is fantastic with the cuttlebug. Amy, this card is so cute! I love the snowman and the bright colors you chose. Great textures, and use of different papers. Thanks for being a special part of the Cuttlebug Challenge this week! Amy I totally love snowmen and I have to say this is darling you did a beautiful job on this challenge. What cuteness!!! This is just a wonderful wonderful card!